The Zolberg Institute on Migration and Mobility is excited to announce a screening of the award-winning documentary This is Congo, as a part of the Fall Performance in Motion Film Series. 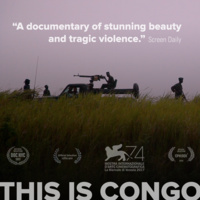 The film, which was awarded best picture in the Boston International Film Festival, takes us into the cycles of war in the Democratic Republic of Congo and provides a very rare look inside the Congolese Army (FARDC), while also following the movement of internally displaced people in the region. The screening will be followed by a Q&A with the film’s producer/editor Alyse Ardell Spiegel and Tatiana Carayannis, director of the SSRC’s Understanding Violent Conflict program and a scholar of UN peace operations in the DRC. This event is free and open to the public. Snacks will be provided.